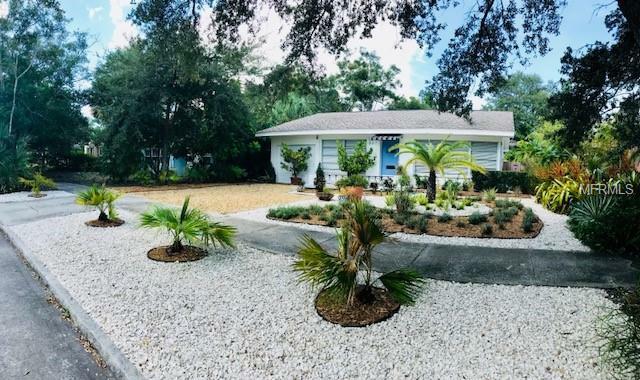 This is a Rare find in Charming Historic Old Southeast Neighborhood completely remodeled Mid-Century residence.This light and bright home features an open split floor plan of 2 bedroom 2.5 baths Fully furnished, with some of the owners personal art collection. French doors that lead to fenced backyard oasis.Stainless Steele appliances, Quartz counter tops, Gleaming Terrazzo flooring, washer/dryerBarbecue grille and spacious wood decking. The backyard is large, with tropical full lush mature landscaping sustained around the entire property. Additional parking pad with alley access.Annual lease available. Verify room sizesOnly 3 blocks Old Southeast Lassing Waterfront Park5 min drive to vibrant downtown and popular Beach Dr. shops, restaurants, museums galleries. convenient location just minutes to I-275.